TFS 2012 introduces a new type of Lab environment called Standard Environment. 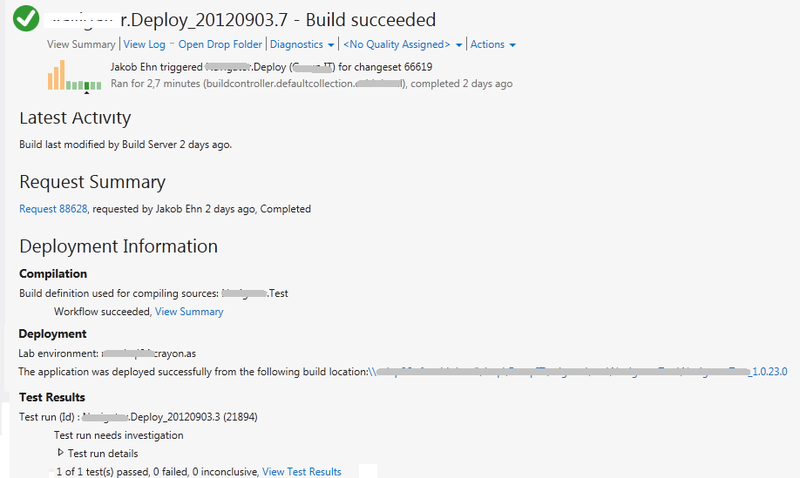 This allows you to setup a full Build Deploy Test (BDT) workflow that will build your application, deploy it to your target machine(s) and then run a set of tests on that server to verify the deployment. In TFS 2010, you had to use System Center Virtual Machine Manager and involve half of your IT department to get going. Now all you need is a server (virtual or physical) where you want to deploy and test your application. You don’t even have to install a test agent on the machine, TFS 2012 will do this for you! Although each step is rather simple, the entire process of setting it up consists of a bunch of steps. So I thought that it could be useful to run through a typical setup.I will also link to some good guidance from MSDN on each topic. First of all, note that you do not have to have the Test Controller running on the target server. It can be running on another server, as long as the Test Agent can communicate with the test controller and the test controller can communicate with the TFS server. If you have several machines in your environment (web server, database server etc..), the test controller can be installed either on one of those machines or on a dedicated machine. To install the test controller, simply mount the Visual Studio Agents media on the server and browse to the vstf_controller.exe file located in the TestController folder. Run through the installation, you might need to reboot the server since it installs .NET 4.5. 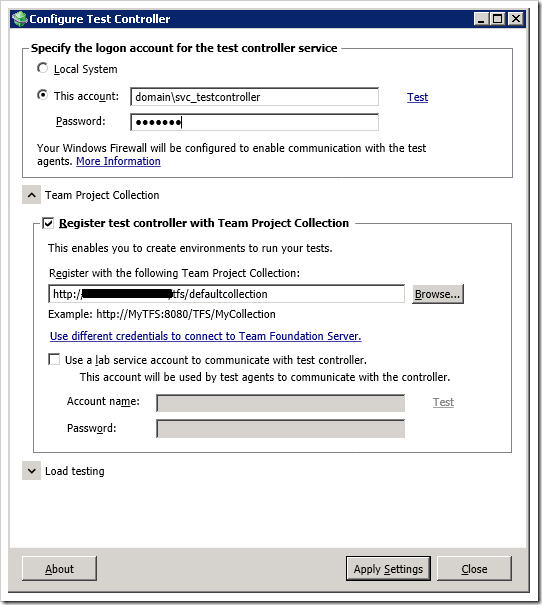 When the test controller is installed, the Test Controller configuration tool will launch automatically (if it doesn’t, you can start it from the Start menu). Here you will supply the credentials of the account running the test controller service. 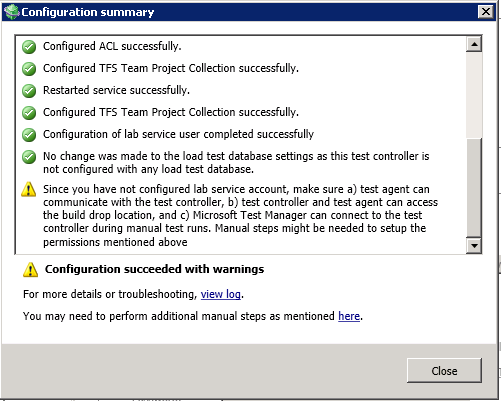 Note that this account will be given the necessary permissions in TFS during the configuration. Make sure that you have entered a valid account by pressing the Test link. When you press Apply Settings, all the configuration will be done. You might get some warnings at the end, that might or might not cause a problem later. Be sure to read them carefully. 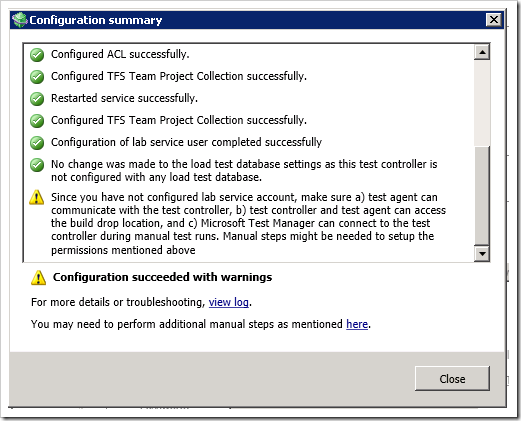 Now you need to create a Lab environment in Microsoft Test Manager. Since we are using an existing physical or virtual machine we will create a Standard Environment. Open MTM and go to Lab Center. On the next page, click Add to add a machine to the environment. 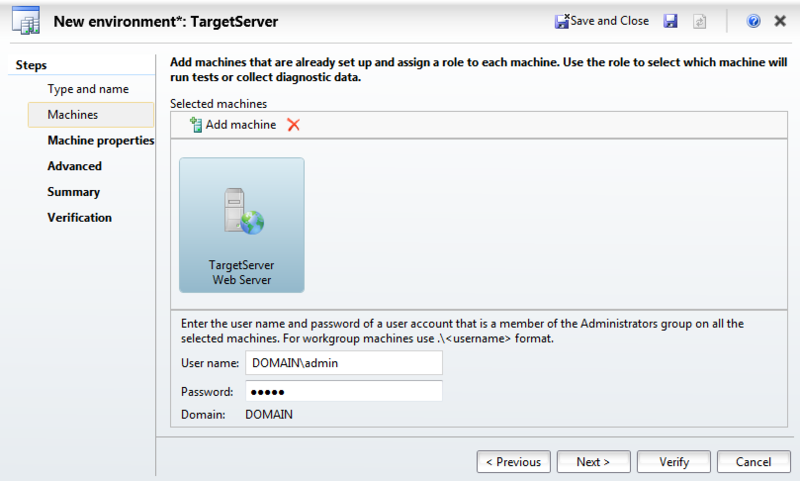 Enter the name of the machine (TargetServer.Domain.Com), and give it the Web Server role. 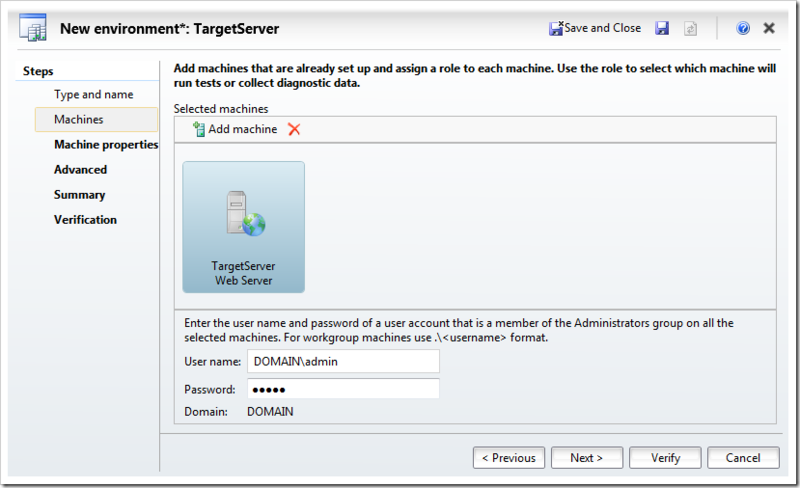 The name must be reachable both from your machine during configuration and from the TFS app tier server. You also need to supply an account that is a local administration on the target server. This is needed in order to automatically install a test agent later on the machine. On the next page, you can add tags to the machine. This is not needed in this scenario so go to the next page. Here you will specify which test controller to use and that you want to run UI tests on this environment. 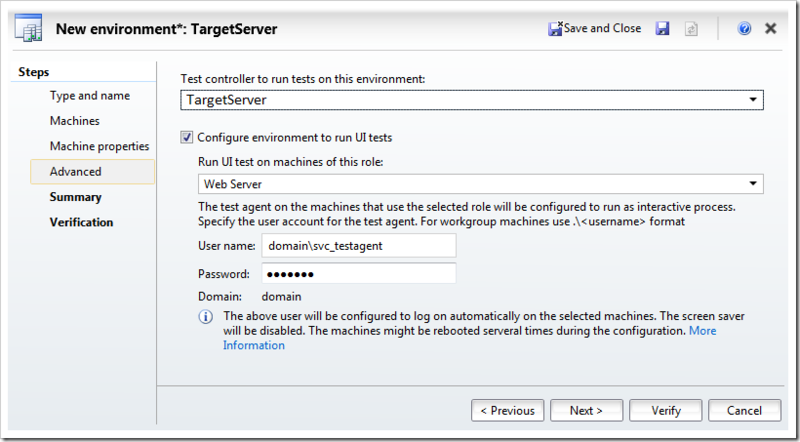 This will in result in a Test Agent being automatically installed and configured on the target server. 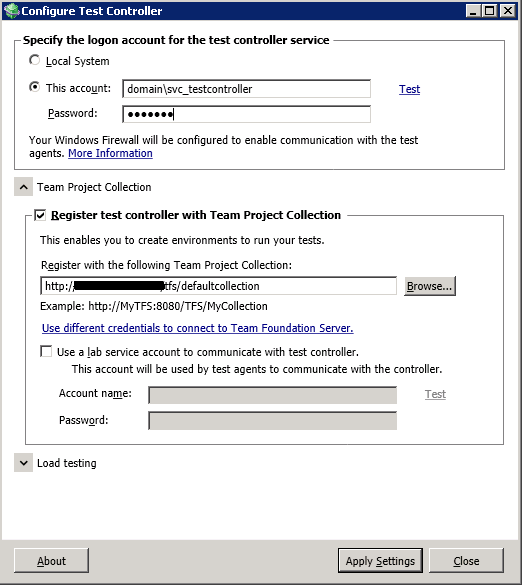 The name of the machine where you installed the test controller should be available on the drop down list (TargetServer in this sample). If you can’t see it, you might have selected a different TFS project collection. Press finish. This will now create and prepare the environment, which means that it will remote install a test agent on the machine. As part of this installation, the remote server will be restarted. I will not cover step 3-5 here, there are plenty of information on how you create test plans and test cases and automate them using Coded UI Tests. In this example I have a test plan called My Application and it contains among other things a test suite called Automated Tests where I plan to put test cases that should be automated and executed as part of the BDT workflow. OK, so now we want to automate our Coded UI Test and have it run as part of the BDT workflow. You might think that you coded UI test already is automated, but the meaning of the term here is that you link your coded UI Test to an existing Test Case, thereby making the Test Case automated. And the test case should be part of the test suite that we will run during the BDT. Open the solution that contains the coded UI test method. Open the Test Case work item that you want to automate. Go to the Associated Automation tab and click on the “…” button. Now we are ready to create a build definition that will implement the full BDT workflow. For this purpose we will use the LabDefaultTemplate.11.xaml that comes out of the box in TFS 2012. 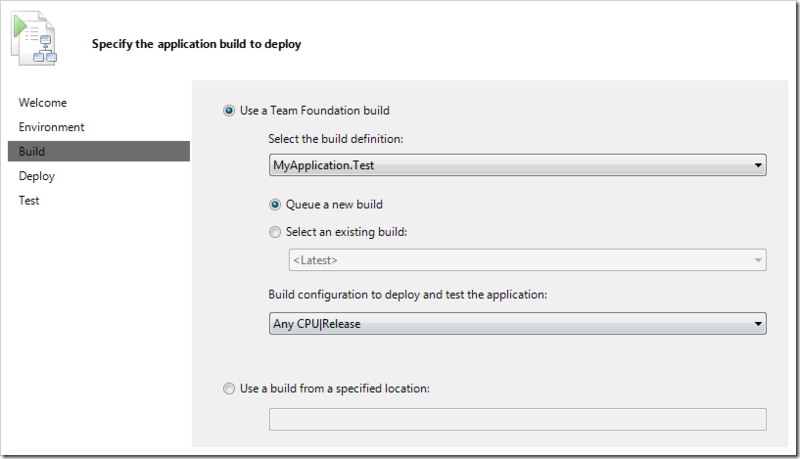 This build process template lets you take the output of another build and deploy it to each target machine. Since the deployment process will be running on the target server, you will have less problem with permissions and firewalls than if you were to remote deploy your solution. So, before creating a BDT workflow build definition, make sure that you have an existing build definition that produces a release build of your application. Define a workspace for the build definition. Note that a BDT build doesn’t really need a workspace, since all it does is to launch another build definition and deploy the output of that build. But TFS doesn’t allow you to save a build definition without adding at least one mapping. On Build Defaults, select the build controller. Since this build actually won’t produce any output, you can select the “This build does not copy output files to a drop folder” option. 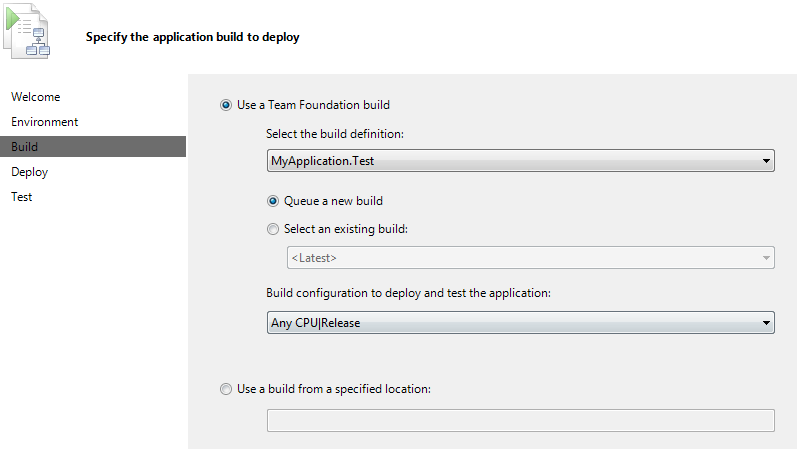 Select which build that you want to deploy and test. 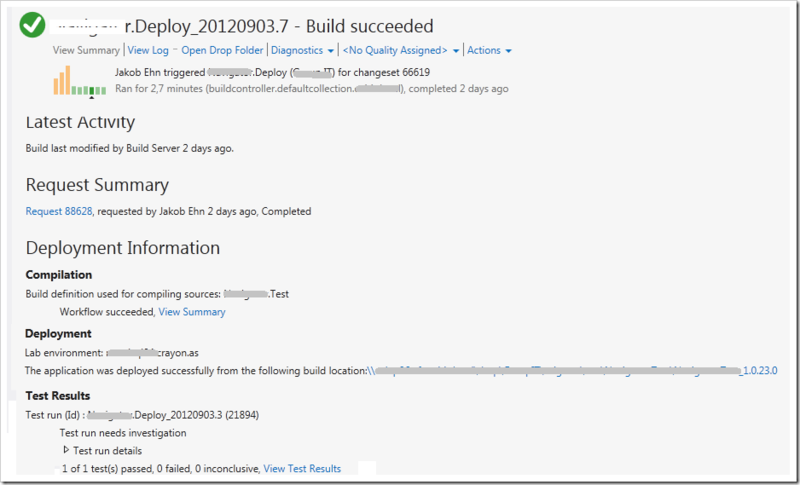 The “Select an existing build” option is very useful when developing the BDT workflow, because you do not have to run through the target build every time, instead it will basically just run through the deployment and test steps which speeds up the process. 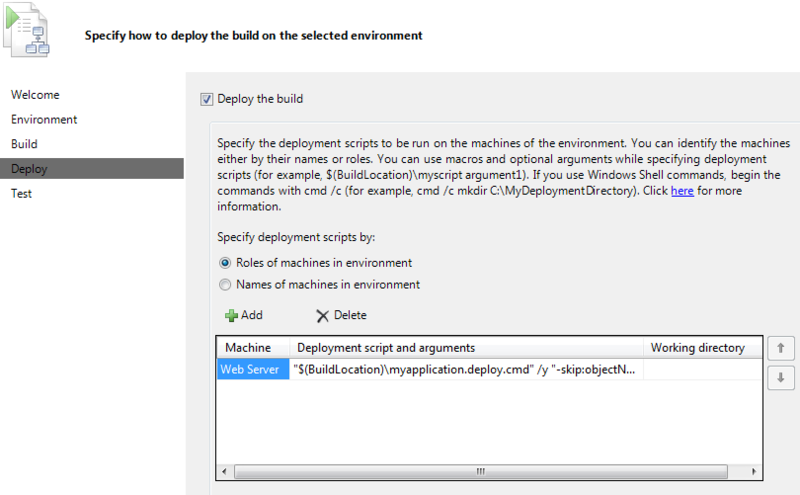 On the deploy tab, you need to specify how the application should be installed on the target server. You can supply a list of deployment scripts with arguments that will be executed on the target server. 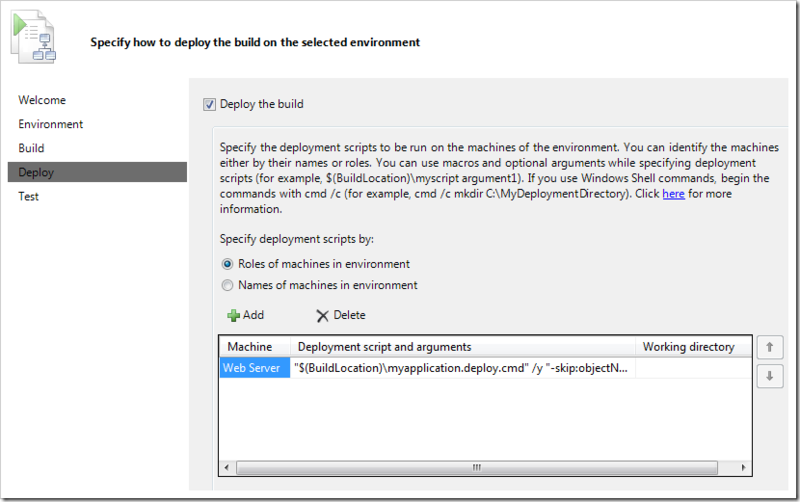 In this example I execute the generated web deploy command file to deploy the solution. If you for example have databases you can use sqlpackage.exe to deploy the database. If you are producing MSI installers in your build, you can run them using msiexec.exe and so on. A good practice is to create a batch file that contain the entire deployment that you can run both locally and on the target server. Then you would just execute the deployment batch file here in one single step. As you can see, I specify the path to the myapplication.deploy.cmd file using the $(BuildLocation) variable, which is the drop folder of the MyApplication.Test build. Note: The test agent account must have read permission in this drop location. Note that I also selected the automated test settings (called TargetServer in this case) that I have defined for my test plan. In here I define what data that should be collected as part of the test run. Do i need to build my automation code along with my application code , inorder to do this . I need to implement the build- deploy-test workflow. I will be deploying into a virtual machine. I have prepared my coded ui scripts in visual studio and checked in the solution to source control. I have also associatd these test methods to the test cases in mtm. Now do i need to build my automation solution along with the application solution. Note that if I run that dir command with the UNC path from a dos prompt on the second box it executes successfully without prompting for a login. I have turned off the Windows firewall on both VM’s. Both VM’s are running on the same physical machine. I have told both boxes to use the Administrator login in all places I can find. Still get the access denied. Any ideas? I believe that you also need a build agent installed on your second box. 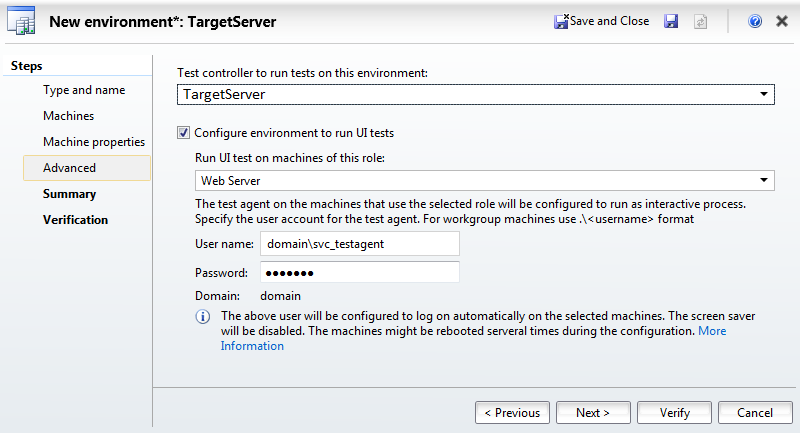 The deployment commands run in the context of the build agent on the target server, not the test agent. All the test agent does is a) execute tests, or b) enable the collection of test data (code coverage, ASP.Net instrumentation, etc.) on a remote machine. I’m facing the same problem (“Access is denied”). Thanks for the post. It was surprising to know that, BDT workflows cannot be triggered as a Gated-Checkin. In my project, we would like to trigger a BDT workflow as part of a gated checkin process. Is there a workaround? I could certainly think about developing a custom workflow for achieving this. I wanted to know your thoughts about solving this issue using a custom workflow? Is there a way to display/view such the dashboard for this type of workflow? Like in jenkins. Is there any way where we set instructions in our build workflow to close browser once all tests are executed.